So as some of you may have read, I participated in a 3-day challenge using Pure cuticle oil from Simple Nail Art Tips. Well, the results are in! But before we get to that, I have a few things you need to read. Ana Seidel of www.SimpleNailArtTips.com and www.NailCareHQ.com has created a nut-free cuticle oil that I fell in love with after just a few applications. I have the "crisp" scented one and it is wonderful. Nothing too strong but also no medicine smell like other cuticle treatments I've tried. If you're interested in purchasing some for yourself you can do so here at PureNailOil.com. The Initial Hydration Treatment was the Challenge that Ana put out for people to try. This is a 3-day treatment that requires you to have naked nails the entire time. These are the instructions that came with my refill order. "Your nails will absorb the oil like a sponge so you will be reapplying frequently. It is best to use the oil bottle for this treatment. Otherwise, you will use up the pen in one day." 1. 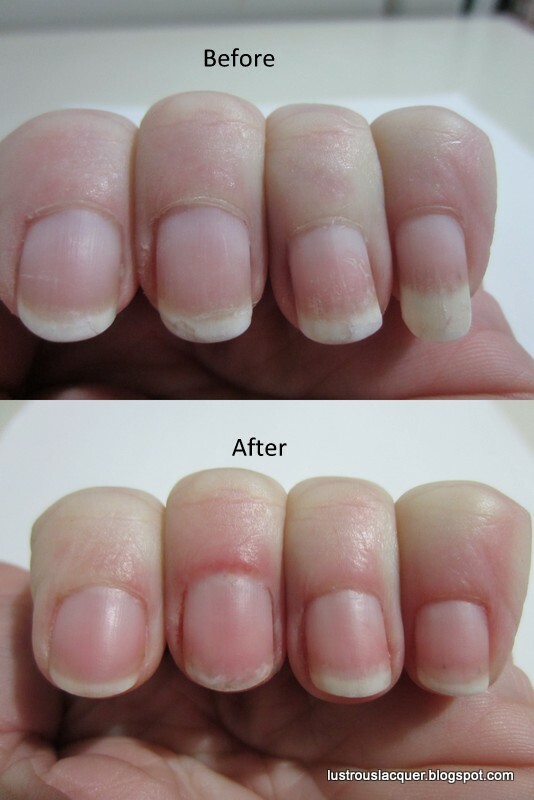 Remove all nail polish. 2. Brush oil all over your nail, cuticle, sidewalls and under your free edge of the nail. 3. Periodically through the next hour or two, rub the surface oil into your nails. Each time you do this your nails will feel less oily. 4. When you feel the oil has been absorbed and your nails aren't oily, reapply. 5. Repeat steps 2 to 4 for the first three days. When you get to the point that it takes your nails 4 hours or more to absorb the oil, you can move to the basic daily application. I want to remind you of what my nails looked like before I started the treatment. As you can see they were in terrible condition. Very dry and screaming for some TLC. The cold Minnesota winter has taken its toll on my hands this year. It would probably help if I wore gloves but I feel clumsy in them, and I'm stubborn. I have to tell you that I was a naughty lacquerista and didn't follow the instructions. I really couldn't with the job that I have. I was informed by my boss that since I mix paint and stock food for most of my shift, he didn't want to run the risk of the oil getting into the paint or touching the food. *side note* While the oil smells absolutely delicious it does not taste that way. I may have found this out the hard way..... twice. So what I did was an application right away in the morning while I was getting everyone ready for school. On a break at work I would apply a small amount just around the cuticles that I could rub in quickly. About a half an hour before bed I would do another application rub it in slightly and then let it soak in for 30 minutes before crawling into bed. Unfortunately I had 2 nails break on Monday so I had to trim my nails down to nubbins during the challenge but the results are still clearly visible. The skin around my nails is softer, and not as ragged. My cuticles look better all around and the dry patches on my nails are gone. Even the natural nail coloring is better. I wish I was able to do the full treatment, I'm sure my nails would be in even better shape than this! My plan right now is to keep up the treatment schedule I have been using for the rest of the week and then resume my normal polishing. I am so grateful that Ana sent me a pen to try before this was available for sale. I really think this is a great product and know that once you try it, you will never want to use another cuticle treatment again. And now, just because I can, I'm going to leave you with a comparison picture of day 1 and day 3 so you can really see the difference for yourself.